After all Marcela's work yesterday bailing out most of the water from the swimming pool, we had a storm last night! So today, being Saturday, I had no intention of working all day, but we needed to get the plastic sheet in place. When I returned from doing the food shop in town, I got out the plastic sheet I had bought from Homecenter, which was bought as 20m x 3m, and laid it out down the garden path, measuring 10m and cutting it,, then we laid out the second piece, and surprise surprise is was only 9m, so Homecenter are robbing people by selling pre-cut plastic, down sized! As it turned out it didn't effect my project as I didn't need the whole 10m. We then aligned the two sheets and stuck them together with duct tape. I then had to put the plastic away in the workshop, it was so hot outside, it was tearing like tissue. 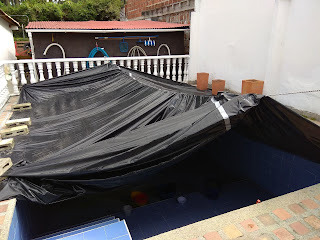 Mid afternoon, it had cooled down, so out came the plastic, and with Marcela's help, I was able to get it in position. I used the garden pots, and a steel plate, down one side, and concrete blocks along the other, the four corners are roped. The concrete blocks had me worried if there was a strong wind, they could be dragged into the body of the pool and smash the tiles, so I have looped a piece of twine through each block and loosely tied them back to the balustrade. 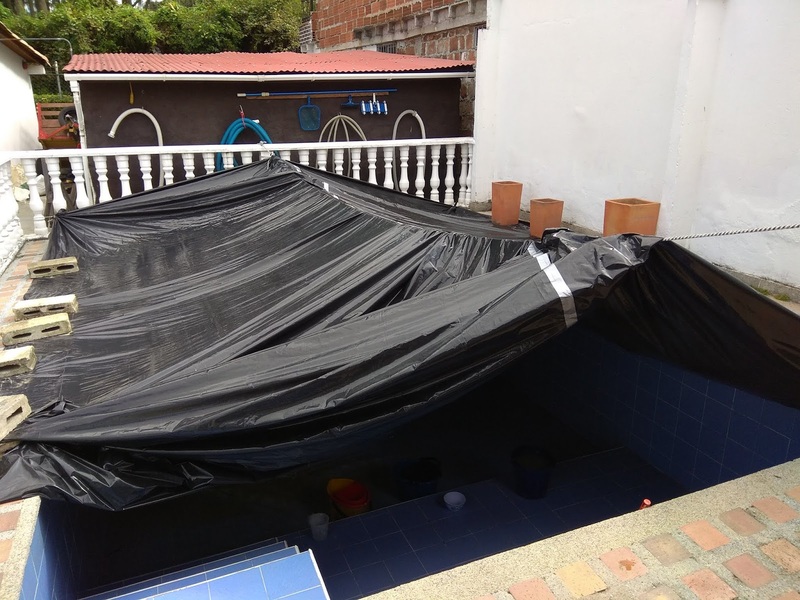 At the moment, Marcela is again in the pool, under the sheet, mopping out the last of the water, whether this sheet will do what is wanted of it, the next storm will tell.